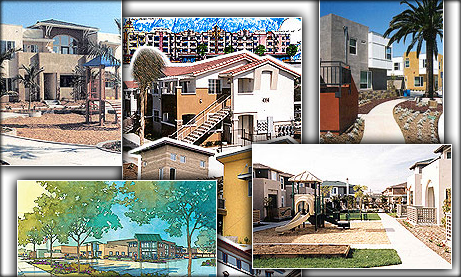 Affordable housing projects. Image courtesy of city of San Diego. The San Diego City Council gave final approval Monday to a compromise plan for a fee increase on commercial construction to fund the city’s affordable housing projects. The deal, approved on an 8-1 vote, ends a struggle between housing advocates and business leaders over the future of the fee, which was instituted in 1990. Six years later, the levy was halved as an economic stimulus. Last year, the City Council approved restoring the charge to its original level — but as the city’s independent budget analyst pointed out, the hike would have ranged from over 300 percent to more than 700 percent on certain types of building projects. Opponents collected enough petition signatures to get the council to rescind the increase, which led to the compromise. Provisions include returning the fee — which is calculated based on a project’s size and scope — to its 1990 level, phased in over three years beginning on Jan. 1; exempting developers of manufacturing, warehouse and nonprofit hospital projects from paying the fee as an economic development incentive; and maintaining current fee levels for research and development construction for the same reason. The deal was hammered out by the San Diego Housing Commission, which runs the city’s affordable housing programs, and the Jobs Coalition, a business group. Final details were ironed out by Councilwoman Myrtle Cole. City officials concede that the amount of money to be raised by the fee is a drop in the bucket compared to the need in a city which has 47,000 families on waiting lists for housing assistance. Councilman Scott Sherman cast the dissenting vote, which was taken without comment as part of the panel’s consent agenda.